Do we really need an Uber Healthcare to bring Doctors to our homes? 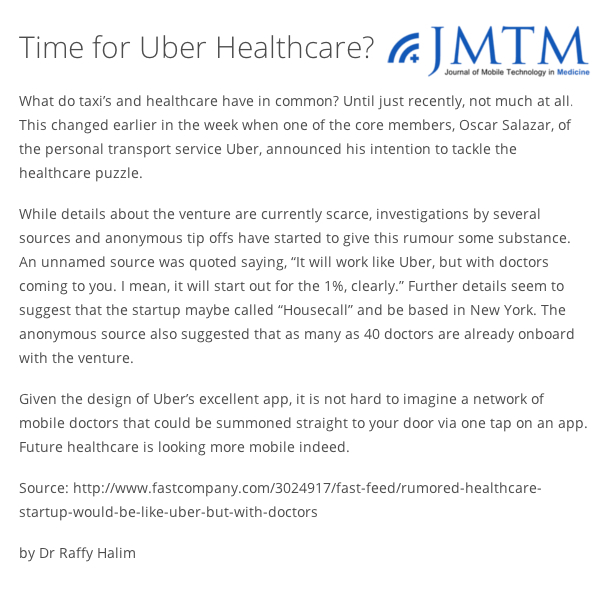 I picked up this story at a new website that’s interestingly called The Journal of Mobile Technology in Healthcare (HatTip: The Doctor Weighs In) that suggests using an Uber Healthcare would be a good thing. I think this says enough so I’ll side step a discussion of the problems that Uber Healthcare would face (introducing the secret ‘Rider rated’ concept to healthcare would be interesting when a Patient makes a FOI request for the information Doctors have been secretly sharing about them!) but I thought it worth sharing my thoughts as this appears to be a classic misunderstanding I see expressed by people who think the mHealth opportunity lies in using mobile technology to access conventional healthcare services and it disappoints me that even the technologists that are advocates of mHealth are seemingly unaware of the opportunity we have to use the tools of our time to not just prop up the tired old ways we had of doing things and contribute to the fundamental access problem but to actually solve the problems of our time (e.g. that “the 2000 year old model of healthcare is broken forever“). > Dr John Bachman MD, Professor of Primary Care at the Mayo Clinic, has shown us in this Mayo Clinic Proceedings paper published in 2011 that Patients and Carers can safely use Interactive Patient History Taking Questionnaires to efficiently provide documented care (click here to appreciate some of the benefits for us all if the healthcare industry can make this step change) and avoid the need for 40% of Patients to make the trip to the Doctors office. In a pilot published in 2013 by NHS GP Dr Amir Hannan it was shown that even in the NHS (where you aren’t charged anything for a consultation with a Family Doctor or visiting a Walk-in Clinic or Hospital Emergency Department) the use of these clinically validated interactive questionnaires is something that Patients felt “made perfect sense”. > Tomi Ahonen, Forbes #1 Mobile Industry Guru, has predicted and shown us how every single giant industry has moved to a position today where they see their future heading to mobile. A future where everything that can or will benefit from being done digitally will be done via mobile devices and/or networks. Now I’m not dismissing the idea of Family Doctors making house calls to their Patients but the idea of sending a Doctor who doesn’t know you around to your house in his car as a first response to the need for healthcare advice should in 2014 seem like something our great grandparents did and as we move forward and consumer technology is increasingly adopted by Healthcare professionals and healthcare technology is increasingly converging with mobile technology I think it’s going to soon seem as daft as me sending you a CD recording of a music track via an Amazon Prime Air drone delivery. 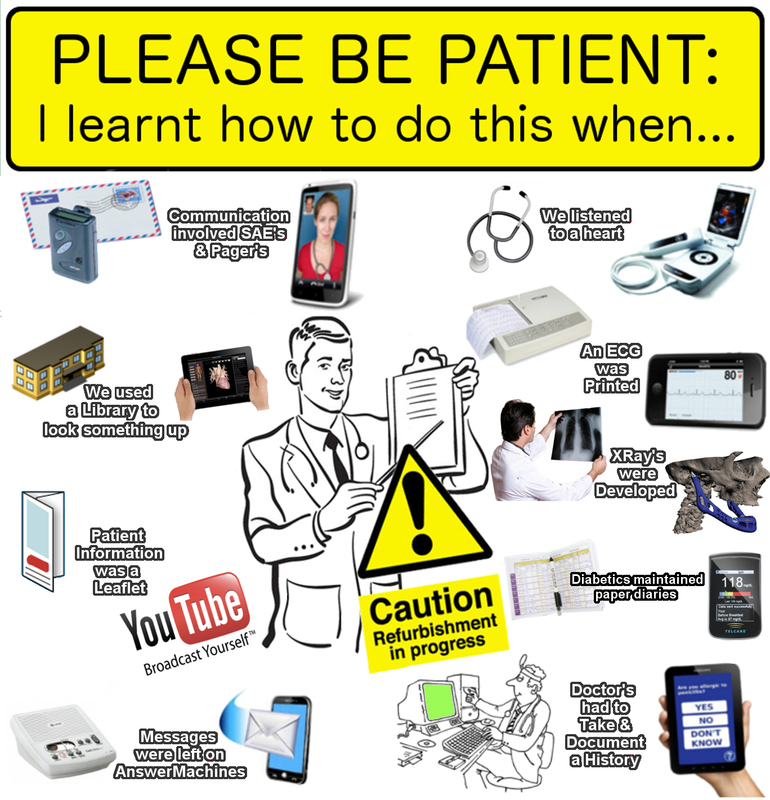 Thankfully I think this is a self correcting problem as Patients are just going to move on from Doctors who refuse to use secure modern tools to communicate with them and manage their health needs. > I’m quite confident that if a time traveller arrived from the 1960’s the thing we’d have most trouble explaining to her would not be the technology we’ve got today but how little we actually do with it. 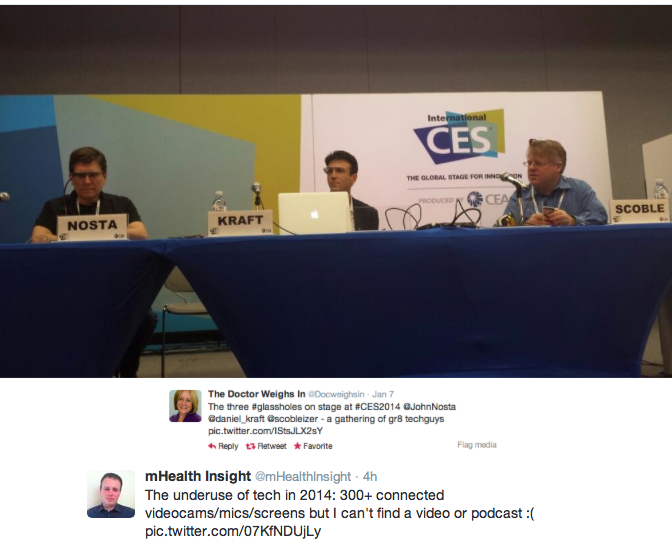 I noticed a good example of this complete underuse of mobile technology at the recent Digital Health Summit at the Consumer Electronics Show in Las Vegas. One panel featured 3 successful execs who were all WEARING mobile connected microphones, speakers, screens and video cameras on the side of their skulls while addressing a 200+ room chock full of delegates who were themselves carrying at least one smartphone each but can I find and watch a YouTube video or download a podcast of what was said and the questions that the audience put to them?